Full Wordpress 3.0, 3.1, 3.2, 3.2.1, 3.3.1, 3.3.2, 3.4 and 3.4.2 Compatibility! 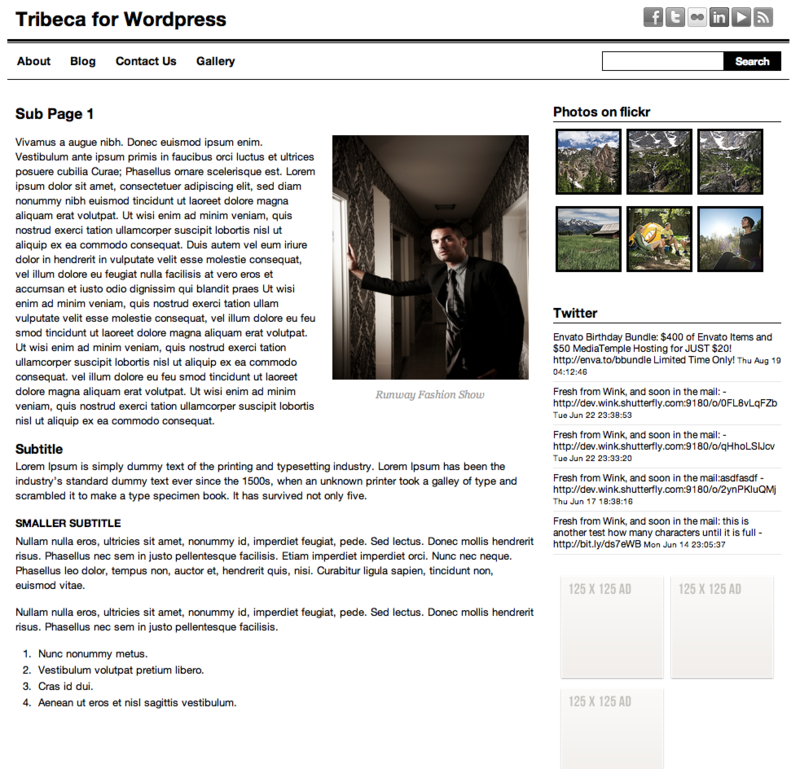 Tribeca for WP is the Wordpress version of our popular selling Tribeca for Magento theme. Enjoy a high quality theme to use as-is or to use as a clean palette to customize your own design for yourself or your client/s. Like many fashion boutiques these days, Tribeca for WordPress uses minimalist design to give off an air of urban sophistication. At the same time, the theme’s simplicity can create any type of ambience with the right product photos. 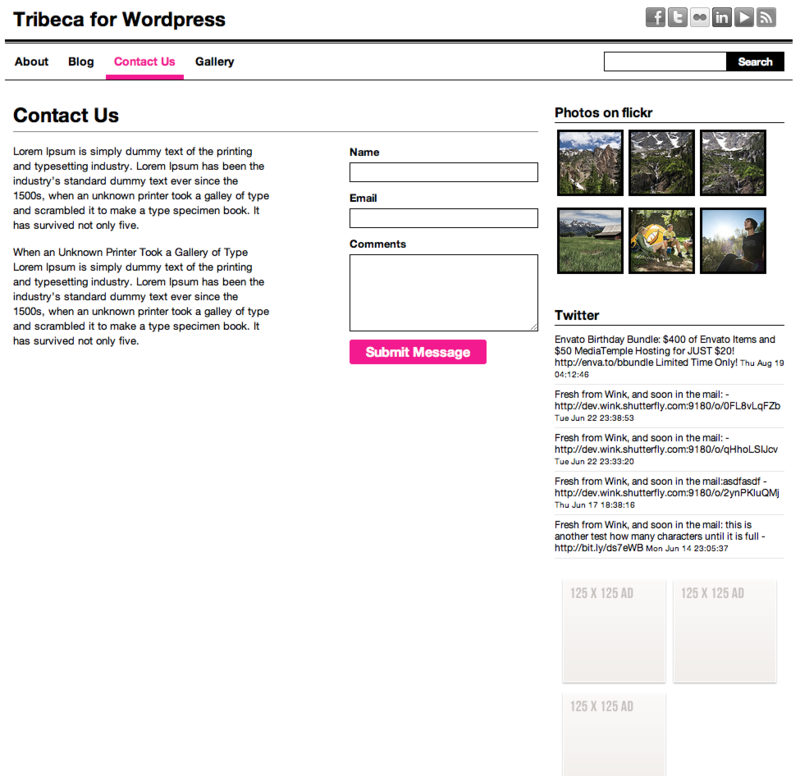 Tribeca has several custom theme options that simplify the process of creating and modifying key elements of your website such as the homepage slider, the footer and social links. There are also three page templates available to help you set up a blog page, contact form and a photo gallery. The gallery pages include free Lightbox gallery integration. Three custom widgets can be added to each page’s sidebar. A Flickr widget displays either random or the most recent photos from your Flickr account. A Twitter Stream widget shows up to ten of your recent tweets. Finally, a third widget helps you easily display up to six banner ads. Version 1.0 – 2010/10/18 – inception!